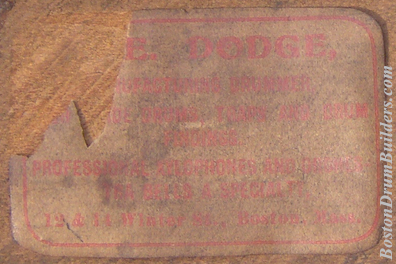 A small ad for the F. E. Dodge Company appearing on the back cover of the Dodge Drum School published in 1909 reads "a drum factory since 1868". It is a dubious claim coming from a man who was born in 1877. The ad goes on to state "over forty years of experience is back of the Dodge drums, tympani, orchestra bells, xylophones, and drummers' traps". How could this be true when the company namesake was only in his early thirties? Frank Edward Dodge was born on July 10th, 1877 in Wenham, Massachusetts. His father Frank Dodge (who has no middle initial) was a native of Marblehead, MA and is listed in the 1880 United States Census as a janitor at Abbott Hall. Frank Edward's mother Maria A. Dodge, formerly Maria A. McCarthy, was originally from Bangor, ME, the daughter of Irish immigrants. By the mid 1890s the Dodge family, including a second son Harry Plummer Dodge born in 1883, had relocated to Boston where Frank Edward received his primary schooling at Boston's English High School graduating as a member of the fourth year class in 1896. F. E. Dodge continued his education at the Massachusetts Institute of Technology enrolling in 1896 as a Mining Engineering major. He would later complete studies in both Mechanical Engineering and Chemistry. According to MIT's newspaper The Tech Dodge was in 1896 - 1897 a member of the Freshman Orchestra serving as the group's treasurer. An MIT Register of Former Students lists Frank E. Dodge as having been at the school from 1896 - 1898 and then again in the years 1900 and 1901. The 1900 United States Census lists F. E. Dodge as a musician still living under his parents' roof at 163 West Canton Street in Boston's South End. The 1900 Boston Directory also lists him as a musician, not a student, suggesting that he had begun his career as a professional drummer by this time. Boston newspapers frequently include mentions of Frank E. Dodge as a featured xylophone soloist at the Boston Theater in 1901 and 1902. By 1903, city directories begin listing Dodge's work address simply as "Colonial Theatre", the newly opened grand theater at 106 Boylston Street opposite Boston Common. Looking again at the 1900 Census, the elder Frank Dodge's occupation is listed as "Mfg - Stitching & Plaiting" while the 1900 Boston Directory lists him as a manager working at 12 Winter Street. These pieces of information coupled together point to the Boston Stitching and Plaiting Company at 12 - 14 Winter Street in Boston. The president of this company was a man named John A. McCarthy whose home address was 163 West Canton Street, the same address as the Dodge family. This confirms a connection both personal and professional between the Dodge family, John A. McCarthy and his Company. A very early F. E. Dodge orchestra drum bears a makers label listing an address of 12 - 14 Winter Street, the same location as the Boston Stitching and Plaiting Company. Also notable about the wording on the drum label is that it reads "F. E. DODGE MANUFACTURING DRUMMER", not F. E. Dodge Company. All of this raises the possibility that there may have been some correlation between the Boston Stitching & Plating Company and the very early years of Frank E. Dodge's drum making endeavors before the founding of the F. E. Dodge Company. Various business listings and advertisements place the Boston Stitching and Plaiting Company at 12 - 14 Winter Street from at least 1898 until 1903. By 1905 the company had moved to 28 Summer Street. The 1906 Boston Directory lists the elder Frank Dodge as working as a treasurer at this address. But by this time the younger Dodge's drum building venture was standing on it's own at 3 Appleton Street. Public Documents show that on December 22nd, 1903 the F. E. Dodge Co. became incorporated under the laws of Massachusetts with a capital of $50,000 to manufacture drums, traps, drum findings, professional xylophones, orchestra bells, and timpani. In tracing the exact origins of the F. E. Dodge Company, it is important to note that no such business is listed in Boston Directories until 1905. In the years immediately leading up to this point Frank E. Dodge is listed as a musician but the F. E. Dodge Company is nowhere to be found. The December 1903 incorporation, as announced in the Music Trade Review in January of 1904, is the earliest documented account of the F. E. Dodge Company. If Frank E. Dodge had founded his drum company in 1903, he would have been just 26 years old. Ayars' statement about Grandsire Baldwin resigning in 1905 cannot be correct seeing that Nahum "Grandsire" Baldwin died in 1896, but her reporting about Blair checks out. Military records show William J. Blair was born in Monticello, New York in 1846. He later resided in Syracuse working as a blacksmith when in January of 1864 he joined Company H of New York's 16th Heavy Artillery Regiment as a musician. Much later in his life, Blair is listed in the 1908 and 1909 Boston Directories as a drummaker at 3 Appleton Street confirming that he did in fact stay on board with the F. E. Dodge Company after Dodge bought out Blair & Baldwin. 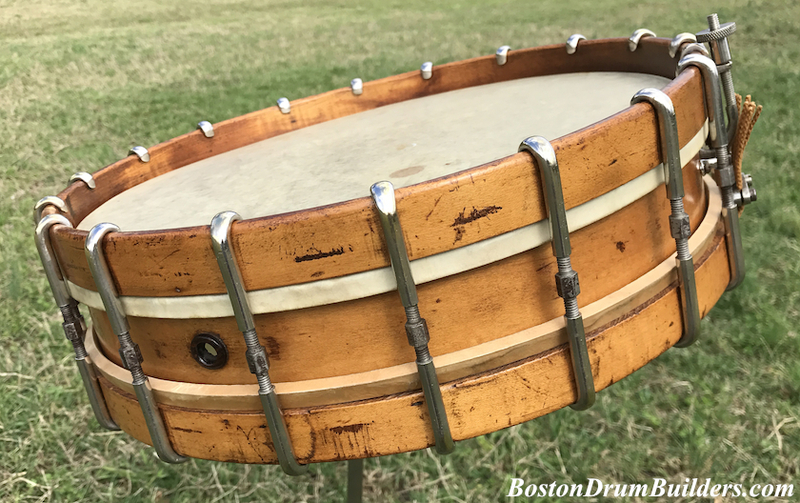 If William J. Blair had been building drums since the late 1860s, then by 1908 he would have had about 40 years worth of experience in the business. And that may well have been the reason that Frank E. Dodge could claim "over forty years of experience is back of the Dodge drums." It certainly wasn't that the F. E. Dodge Company had been founded four decades earlier. 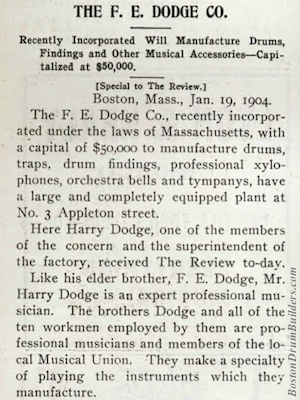 For more on F. E. Dodge and the other early 20th century drum makers of Boston, Massachusetts, please visit BostonDrumBuilders.com. W. Lee Vinson can be contacted any time by email at lee@vinson.net.